There are many issues with immigration that need to be addressed so that immigrants can be helped. Some of the issues include how many immigrants aren’t getting the same schooling, payment at their jobs, or treated the same way as others due to stereotypes and discrimination. 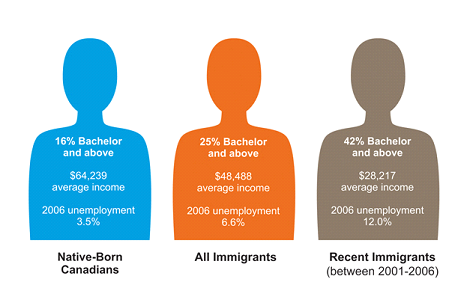 Immigration inequality is a large issue in the U.S. today. Immigration is the act of coming to live permanently in a foreign state.There are many issues with immigration that need to be addressed so that immigrants can be helped. Some of the issues include how many immigrants aren’t getting the same schooling, payment at their jobs, or treated the same way as others due to stereotypes and discrimination. Many of the immigrants could be the future doctors, physicians, veterinarians, and in the forces. But due to the stereotypes and the government making the immigrants leave the country, they aren’t getting the amenities that they should be getting. Donna Poisl believes in equality for all immigrants no matter where they are coming from according to this quote that was by her: “But the bravest, strongest, most determined, entrepreneurial people from poor countries took a huge chance and moved here to build a better life for themselves. In the process they built a better country for all of us.” The middle east needs the most immigration assistance because of how the it has the highest percentage of immigrants leading to more room for homelessness, discrimination, and the immigrants being told to leave from whatever country they immigrated to. According to the website "The telegraph" the middle east has the largest amount of immigrants coming in every year. "Countries in the Middle East have the highest number of migrants as a proportion of their population, according to analysis by The Telegraph". I believe that immigration should definitely be a priority of the future president because of how those that immigrated to the USA have many of their own unique ideas that would help make a reality, they could create new companies and boost earnings for American workers. Those are just a few reasons why immigrants should be able to stay in the country legally and how important it is to let them start a life in the country they decided their life should start. I believe that discrimination directed toward immigrants is very wrong. There is no reason to have inequality against them and there never will be. They are people like the rest of us and they are trying to start a new beginning. For those who aren’t letting that happen and are not letting them stay in the country legally, I think that is very wrong. I believe that giving immigrants the same amenities as those who haven’t immigrated is crucial to making the immigration system have less flaws. Allowing immigrants to stay wherever they immigrated to is what they deserve. It also helps out with economy because of how they are more likely to start their own business, how each of them have their own talent that contributes to the economy, immigrant owned businesses will help to create jobs for Americans as well, and the list goes on. Mr. Furman and Mr. Gray state that “According to the Census Bureau, despite making up only 16 percent of the resident population holding a bachelor’s degree or higher, immigrants represent 33 percent of engineers, 27 percent of mathematicians, statisticians, and computer scientist, and 24 percent of physical scientists. Additionally, according to the Partnership for a New American Economy, in 2011, foreign-born inventors were credited with contributing to more than 75 percent of patents issued to the top 10 patent-producing universities” A man by the name of Justin McCarthy wrote an article on how there are many mistreatments linked to immigrants: "One in four Hispanics report mistreatment in past month, Foreign-born Hispanics report more mistreatment than U.S.-borns and Hispanics' reports of discrimination lower than blacks' reports" This matters a great deal because of how immigrants can contribute to the economy and communities by large margins if they were treated equally and with the same respect that other are given that haven’t immigrated. On the other hand, not everyone agrees with my opinion. There are many who think there are different types of diseases that are brought over from immigration and those who are illegal immigrants shouldn’t be able to become a citizen. Along with this is the stereotype that immigrants are more likely to commit crimes and treason. There was a survey that was taken in in 2016 by Mr. Bradley Jones asking people what they thought on immigration. “Currently, 75% of the public says that undocumented immigrants now living in the U.S. should be allowed to stay legally if certain requirements are met, while 23% say they should not.” This matters because we need to try to educate those on why you shouldn’t have to be against immigration. The immigrants are just trying to find a better life for themselves and those who are against immigration should respect that. Therefore I believe that those who think immigration should not be happening legally should be educated on why discriminating against them and the inequalities that are presented towards the immigrants are not acceptable. And I ask what will you do to help immigrants across the nation? Global Studies class letters connecting national issues to the UN's Global Goals. Abortion should not be allowed to happen, we are killing way to many innocent lives that could have been a big help in our world. We should not let people, especially kids, die from lead-infused waters in schools or from trashed waters. We need to act on this right away. Immigration is a problem that people from different countries face. I think that the president should allow illegal immigrants to become US citizens.